A perfect symbolic piece of jewelry for a mother of triplets. 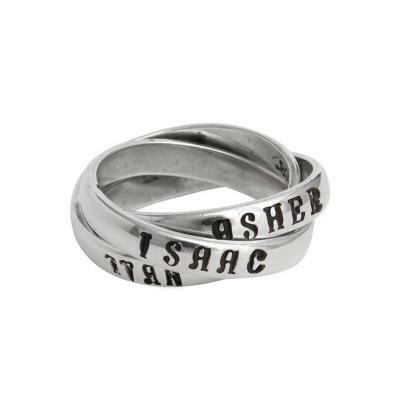 The Triplet's Ring is comprised of three personalized bands intertwined together. A simple statement of love you share for them and they will always share for each other. This is a simple way to keep the triplets wrapped around your finger everyday. The Triplets Mother is particularly symbolic since the three bands intertwine, just as your triplets are and always will be. We will stamp each child's name on a band to create a simple and meaningful ring you will cherish forever. You can keep it simple and put a name on each band. Or (if you have two boys and one girl as an example) you can put two names on one band, the third child on the second band and the birthdate on the third. We can separate the names with a heart, bullet, or any other symbol you choose from our list. Sorry ~we cannot stamp on the inside of the bands. This ring was the perfect gift for my wife after the delivery of our triplets! Thanks so much for helping to make our excellent day even better!